This instalment of You Make the Call features an employee who used foul language and insulted co-workers. Frank Vautour, 49, worked at a breadmaking facility in Moncton, N.B., starting in 1989. In 2003 the facility was bought by Canada Bread Company. Throughout his time there, he had a habit of calling co-workers names and using crude language. 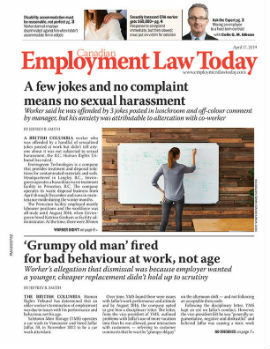 In July 2008, Vautour was suspended for three days after telling a supervisor he would put his foot in the supervisor’s “arse” after the supervisor touched him. In August 2010, he received a one-day suspension for taking an unauthorized break after being told not to. He was warned that any further disciplinary incidents would result in termination of his employment.